Siberian Ice Marathon is an official competition that is included in the calendar of the Ministry of Youth, Physical culture and Sport of Omsk region. Siberian Ice Marathon is the only major long-distance race arranged in Russia in winter. The event is held in extreme weather conditions of Siberian winter. Siberian Ice Marathon is a member of the Association of International Marathons and Road Races (AIMS). Competitions are international calendar AIMS. Siberian Ice Half Marathon is one of the coolest (-20-42 Celsius) races in the world. An international event with more than 20 years of history attracting runners from all over the world to challenge Mother Nature and test their endurance.Siberian Ice Half Marathon is held in the city of Omsk. The Siberian Ice Half Marathon is a unique race in snow-covered Siberia, a celebration of the rich cultural traditions of Siberians as they celebrate a Russian Orthodox Christmas. The competition involves more than 1,000 fans running from 15 Russian regions and foreign countries. Dangers that you might encounter in this race include your sweat freezing around your neck, your eyelashes growing icicles and even your eyeballs freezing up. This was my second time to run the SIM in Omsk, & it was as brilliant the second time as the first. Remarkably well organized, wonderful staff, and the people and heart of Omsk are truly unforgettable... This was my second time to run the SIM in Omsk, & it was as brilliant the second time as the first. Remarkably well organized, wonderful staff, and the people and heart of Omsk are truly unforgettable. Highly, highly recommend for anyone with interest in a trip to magical Russia. 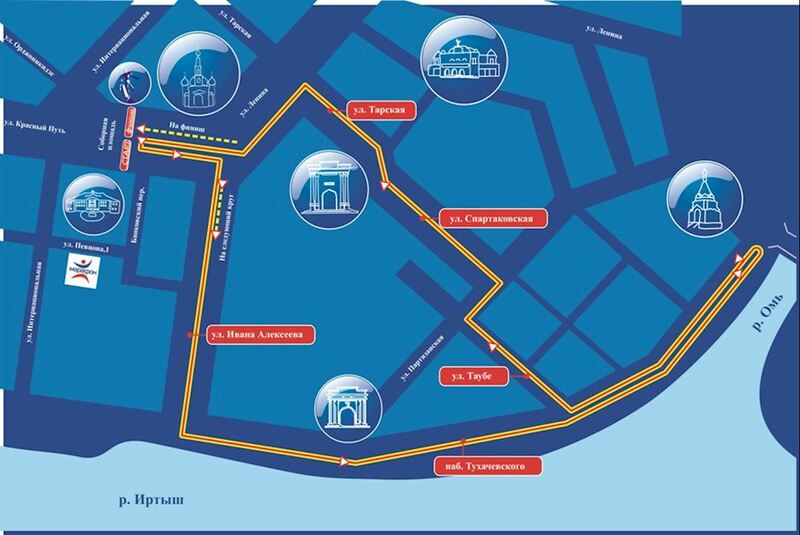 The course consists of 6 laps of 3.5 km and runs through the City center. Start and finish are in the same place. The race passes through the historical centre of Omsk and along the embankment of the Irtysh River. The course is a three and a half kilometre circuit on the riverbank and in the centre of the city, and runners complete it six times to make the distance of the half marathon. More than 1000 fans of running from 15 regions of Russia and foreign countries take part in the half marathon. In 2001 at the tenth anniversary Siberian Ice Marathon the temperature fell to -39 oС. For the whole half marathon history there has never been such a low temperature. Since the runners could get frost-bitten the organizers advised them to run only 6 km in spite of distances they had applied for. Eventually only 13 participants ran 21,1 km. One more interesting fact was that for the first time of Christmas half marathons a woman showed a better time than a man.